Wonderful! This is exactly how I want to quilt mine. Visiting from the finish along. Beautiful Quilt! 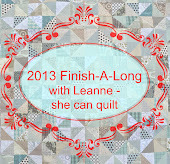 Love those colors and great quilting! !